On Wednesday 26 May 1790, Lord Kenyon sat in Westminster Hall to hear the case of Kennet v Greenwollers (FN1). Thomas Erskine, representing the plaintiffs, called Tyldesley as a witness. Examining Tyldesley on the voir dire, the defendants' counsel sought to establish that under the rules of evidence then in force he was incompetent as a witness since he had an interest in the case. Tyldesley had been declared bankrupt twice. On the first occasion he had paid a dividend of 16 shillings in the pound. However, on the second occasion he had made no payment to his creditors, although he had obtained a Certificate of Conformity. It is Tyldesley's assignees who were the plaintiffs in this case. Tyldesley had paid funds to the defendants and the plaintiffs believed there were grounds on which the sum involved should be refunded. Provided always, and be it further enacted by the Authority aforesaid, That from and after the twenty-fourth day of June, one thousand seven hundred and thirty-two, in case any Commission of Bankruptcy shall issue against any Person or Persons, who after the twenty-fourth day of June, one thousand seven hundred and thirty-two shall have been discharged by virtue of this Act, or shall have compounded with his, her or their Creditors, or delivered to them, his, her or their Creditors, or delivered to them his, her or their Estate or Effects, and been released by them, or been discharged by any Act for the Relief of Insolvent Debtors after the Time aforesaid, that then and in either of those Cases, the Body and Bodies only of such Person and Persons, conforming as aforesaid, shall be free from Arrest and Imprisonment, by virtue of this Act; but the future Estate and Effects of every such Person and Persons shall remain liable to his, her or their Creditors, as before the making of this Act; (the Tools of Trade, necessary Household Goods and Furniture, and necessary Wearing Apparel of such Bankrupt, and his Wife and Children, only excepted) unless the Estate of such Person or Persons, against whom such Commission shall be awarded, shall produce clear after all Charges, sufficient to pay every Creditor under the said Commission, fifteen Shillings in the Pound for their respective Debts. 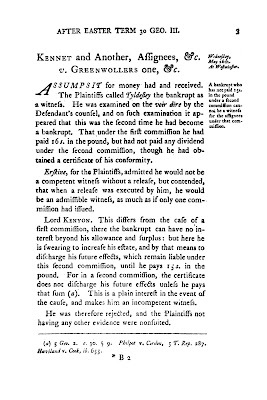 Plainly, therefore, Tyldesley did have an interest, since any recovery would go towards meeting the requirement that he pay 15 shillings in the pound before being relieved of liability. Accordingly Lord Kenyon held that he was not competent as a witness, and the plaintiffs' case collapsed.